What can you say in December other than its Christmastime again. It is of course not “Christmas” for the whole month but it plays such a big part of this time of year with figuring out when you’re going to take leave (or what you are going to do with it), when you are going to see family and what presents are you going to buy people etc. All of which usually result in a number of discussions where we are concerned. For a while we have known that for the company that practically reinvented Santa, their Christmas spirit does not really extend to granting leave to their employees at the end of the year. We have known that when it suited them, they were more than willing to point out that you were employed by the temp agency (not them) so they didn’t really owe you anything but likewise, when it suited them (around the time you would have had to put in a leave form), they were more than happy to point out that they believe you owe them exactly what all their actual employees do (which is a bum on a seat at Xmas) or you could take a hike. Now I understand that this is their busiest time of year but it didn’t exactly imbue us with a warmth of feeling towards them. Any job where you feel you actually want to avoid the Christmas party doesn’t really help you tick the boxes that identify the perfect job either…Anyway, you couldn’t get one day off, end of discussion, whilst my work was pressuring me to take the leave because it was hardly worth paying me to be here was it? When anything that couldn’t wait could easily be accomplished by someone else who really did need to be in the office, why bother paying me to be there at all? But all this was relatively straightforward if not annoying. Family and presents were a little more complicated. Now without any disrespect meant, it is both a blessing and a curse (to me) that your family doesn’t have a tradition of doing the big family Christmas. Since we have been together, we have never denied either of your parents in order to spend Christmas with mine which has worked out well for me because I enjoy spending Christmas with them. The downside is however that since you have never been used to that, you find my family overwhelming and more keenly notice the physical absence of your own. I don’t like seeing that so much. I think this year was a little better though as we actually planned several catch ups with your family for meals before Christmas day. What was interesting this year though was buying the presents. Usually you baulk at the idea that I would spend money on each of my family members at Christmas, the cumulative total of which is into the hundreds. You have seemed to view this as somewhat of a waste considering that you’d be happy for their company but would much prefer to spend that sort of money on yourself and not exchange gifts at all. You viewed presents as a chore (which I will admit, shopping for them can be) and not a pleasure which they sometimes are when truly appreciated. I’m kind of used to this though and so occasionally will try and circumvent the issue by just telling you after I’ve bought something for someone. You don’t seem to think about it as much if you’re not with me when I buy something but this year, we spent more on your relations than we did on mine! We had a couple of wins too I think. Sure, sometimes you give a gift and someone likes it enough to make use of it once before it gets relegated to a shelf somewhere to gather dust but occasionally you hit on things that are really useful as well as appreciated. I don’t think that this has in any way convinced you to go all out on presents next year but just maybe, I am slowly chipping away at your inner Grinch. 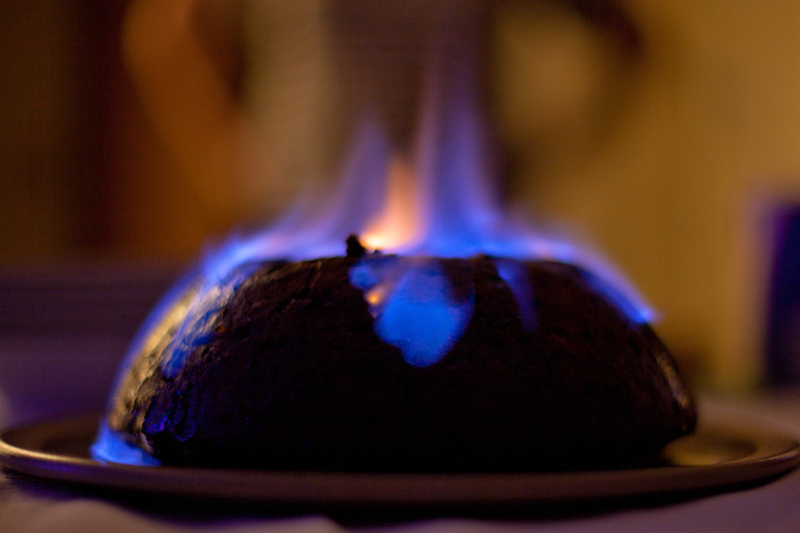 * Photo taken of the flaming christmas pudding at christmas lunch.